Sigma has updated its 18-50mm f/3.5-5.6 and 55-200mm f/4-5.6 zoom lenses to include Hyper Sonic Motor (HSM) functionality when used with Nikon DSLRs. The inclusion of HSM capability into the Nikon D-mount optics is intended to allow ?quite and high-speed auto focusing?, according to Sigma. Designed to ?suit the characteristics of digital SLRs? 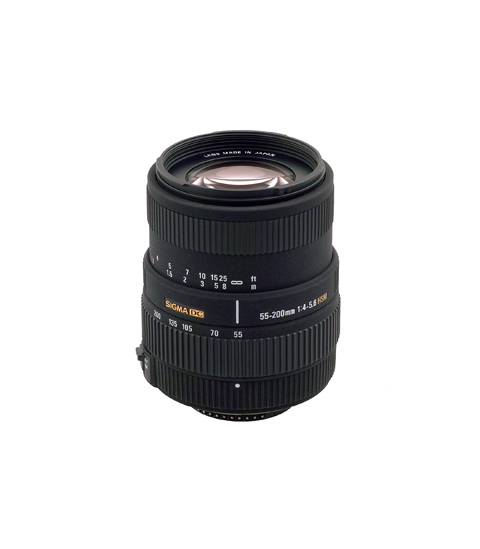 the 18-50mm f/3.5-5.6 DC HSM boasts a minimum focusing distance of 25cm and a maximum magnification ratio of 1:3.5. Priced £119.99 it includes aspherical lenses to help reduce aberrations. Meanwhile, exclusively for use with digital SLRs, is the 55-200mm f/4-5.6 DC HSM (pictured) which is billed as a ?compact telephoto? and priced £159.99. The newcomer weighs 310g and has an overall length of 84.6mm. Sigma points out that vignetting will occur if this lens is used on cameras with image sensors larger than APS-C or on 35mm film SLRs. Sigma first introduced the 18-50mm and 55-200mm lenses in November 2003. For details call Sigma Imaging (UK) Ltd on 01707 329 999.